It is already February and the Wayne Poole Racing team are looking ahead to the start of the 2017 season. It will be the first time in many years that Pete Diccox won't be out in his Van Diemen RF89 following his retirement at the end of the 2016 season but his car has remained with the team and should be seen in 2017. Josh Fisher will be looking to do well in the Castle Combe Formula Ford Championship aboard the Richard Hudson-Evans Van Diemen RF99 that went so well at the Walter Hayes Trophy. Steve Bracegirdle will be back with his Van Diemen RF89 at both Combe and Oulton Park. 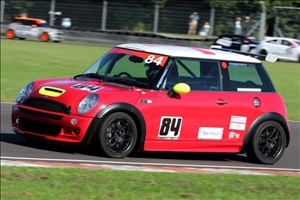 Following the sale of his Nemesis GT Steve will be doing more Castle Combe Saloon car races in the ex WPR Mini (pictured). Nathan Parton will be driving the ex Diccox Van Diemen at Oulton Park while Andrew Higginbottom will start the season at Castle Combe in one of the team's Van Diemens and then decide on the rest of the season. Wayne Poole is also planning to do some Pre '90 rounds at Combe too. Guy Parr will be out in both his Ford Fiesta and MK1 Mini, mainly at Castle Combe. The season kicks off with pre season tests at Castle Combe on April 6th and 13th.